In Secret Societies, the people comprising the lowest levels have no idea what is really going on at the highest levels. A false narrative is put forth as truth, and it is done in such a way to indoctrinate initiates without the initiates knowing they have been indoctrinated. Part of the indoctrination process includes infusing the soul and mind of the initiate with the perceived fact that the society he has joined is the best, most prestigious, first in both importance and influence, and most profitable and advantageous for his life and career. And to prove this, the initiate will be given an open door into some such benefit he would probably not otherwise receive, such as employment, to go along with his initial benefit of belonging to a group, something everyone needs and desires. As the initiate travels upwards through the various degrees, he gains more knowledge and benefits. His life begins being built around and upon the precepts and initiatives of the order, and he begins becoming closer in alignment with the true purpose and intentions of the society, and those toward the upper levels who comprise it. As long as the process takes place through a properly paced and methodical fashion the member grows in his awareness, becomes somewhat distant to the members of the lower orders in the sense of only revealing the knowledge allowable and not revealing the higher knowledge he possesses, and continues in his gaining of higher knowledge and growing closer to those in and around his level. By ascending this ladder of knowledge, he grows closer to understanding the secret teachings that exist only for those at the top who give themselves wholly to the society, and the more his very life is built upon and within said teachings and the society itself. Though he started out committed, he reaches a point of visceral commitment to the society from which he could never exit without destroying his life and that of his family and future descendants. This is why those at the higher levels never leave. The benefits are incredible. They begin receiving the best jobs, the most money, begin moving in the highest circles, and attain a virtual heaven on earth with reference to wealth, material possessions, and political influence. They discover that there is a hierarchy of powerful people who rule the planet, and that they are becoming part of it. During the heyday of the mafia, it is said one could never leave after achieving a certain level, simply because he knew too much. The mafia was a society that clearly instructed its members that they were members for life, and to leave would be the equivalent of treason. As long as a member obeyed the dictates of the order, remained loyal, and did whatever was asked of him he would remain in excellent standing and would be the recipient of the full benefits. Part of being an excellent member was never being a “stool pigeon.” One must never reveal anything that was not to be revealed. The penalty for treason was death. Thus, those who make it to the highest levels of the most prestigious Secret Societies never reveal anything that would expose them for what they are. They never reveal their influence and machinations behind the scenes, their positions of power, their true means of wealth, or the mystical knowledge they possess that makes them what they are. Part of their secret is that they convince lower initiates there are no secrets. They convince them that there is absolutely nothing sinister or held back, that all is open to see for whoever might want to see it, that what you see is all there is, and that the very idea of a Secret Society is absolutely ridiculous. But once one climbs the ladder for a while and gets vested, he realizes he was lied to, but for his own benefit and that of the Society as a whole. The key to keeping secrets then, is having a vested interest to do so. By revealing secrets one loses his vesting, or his benefits. It is the equivalent of being bounced from a bar or being a stoolie. Everyone within the society disowns him. No one will help him or grant him a position or employment. He essentially gets kicked to the street. And some pay with their life. For any single man it is easier to get out, but the benefits of the society extend not only to the individual and his immediate family, they continue to extend to his descendants. Long term Secret Societies develop a gradualist approach that honors a family line, and as long as the individual descendants toe the mark and do all that is required, the benefits keep coming. This is actually very good for the society because it develops multi-generational loyalty and establishes solid family groups that act as both the foundation and glue that keeps it together and stable. But for one to think that only human beings are involved in such longstanding, high level, powerfully influential, and extremely wealthy Secret Societies is not only naïve, it reeks of pure bullheaded, stiff-necked, and close-minded ignorance. The Lord Jesus calls the devil “the ruler of this world” (John 12:31, 14:30, and 16:11). This is archon kosmos in the Greek. It refers to that which has been built on this planet by the devil and his invisible guys in concert with fallen humanity. This kosmos is not the planet, it is the fallen world of sinful man built upon this planet. It existed at the time of our Lord when He revealed it, exists now, and existed long before the Lord walked among us. It has managed to circumnavigate the globe. It has succeeded in establishing itself almost everywhere and has achieved its greatest level of unity and universality to date. It will eventually succeed in becoming a single worldwide entity in complete control of everything with complete knowledge of everything and everyone. Its absolute and total fullness is almost here. Yet, there is one, and only one other society on this planet that is not part of this kosmos, and will never be—the community of the Lord Jesus. Hence, there has always been and always will be persecution directed from the devil’s kingdom against the Lord’s kingdom. It is the battle of Light and darkness, and as far as the devil is concerned, one must either join up and worship him or be killed. 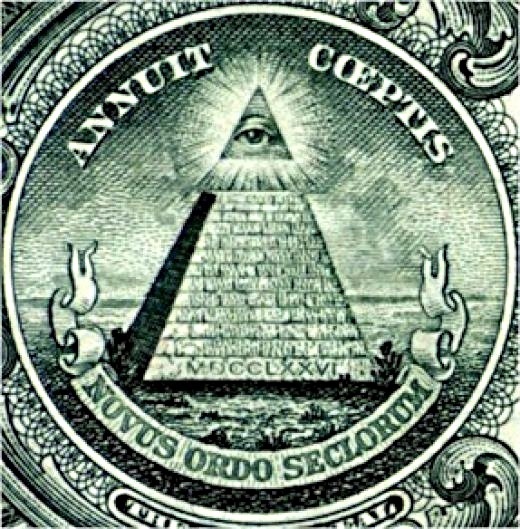 Thus, the devil has built a universal Secret Society with himself ruling from atop a mystical pyramid. But one of the great secrets to his success in denying that he has done any such thing. And even more than this, he denies that he even exists. Its much easier to stay hidden when he indoctrinates people into believing he’s not even there to begin with. Every member of the Lord’s community has been born into it (John 3:3-8). Every member enters through faith and repentance. Every member obeys Him, His teachings, and His commandments. Every member is saved by grace. Every member is wholly committed to Him in love and honor. All of this is required, or there can be no actual fellowship with God or one another. But there are deceivers and those who have been deceived. Some who are members of the first group think they are members of the Lord’s group. And one must notice that unreal Christianity in all its forms is built exactly like a Secret Society and is in fact the same thing, and exists as part of the devil’s kingdom. Unreal Christianity contains a hierarchy, a mystical pyramid structure, an initiate program, a spiritual ladder, ignorance of its true existence and purpose at the lower levels comprised of most of its members, and secret knowledge known only to those at the top. It is worldly, looks like the world, pays much more attention to head knowledge than possessing a true heart for God and knowledge of Him, and has much more in common with ancient religions than the community of the Lord Jesus. Its members refuse to be filled with the Spirit of God as per the Book of Acts historical model, and has invented a baptismal formula that refuses the Name Above Every Name. © 2013 by RJ Dawson. All Rights Reserved. Posted on December 28, 2013, in Current Events and tagged All Seeing Eye, Book of Acts, Community of the Lord Jesus, Gnosis, Lord Jesus, Real Christianity, ruler of this world, Secret Societies, Unreal Christianity, Yehoshua HaMashiach. Bookmark the permalink. 8 Comments. Somber but real post, RJ. I don’t know if you’ve read Mike Warneke’s book The Satan Seller, but he illustrates the point you make in terms of satan blessing those who are loyal to him and that there are progressive levels of “knowing” and service. Warneke was pretty high up there in an org, I guess you could call it a huge coven, until he broke free and returned to God. Thing is, many are loyal to satan unawares and actually by default. If you are not God’s, you are from the kingdom of darkness. All would do well to heed and consider your post and this comment. The enemy, knowing he must deceive, because he knows he really has no message at all, only darkness and dead ends and lies, rarely reveals anything at all except to the high-ranking ones who have essentially sold their souls. And even that is cloaked in deception. Wizard of Oz. Little man behind a curtain with a microphone and levers. Deception it is. And counterfeiting God’s ways. Recently a woman who had been a JW for 38 years thought she had been freed from that organization to find “the truth” outside of following Jesus. satan got to her emotionally by pretending to be her deceased daughter. Physically, she had been terminally ill and received healing. That’s when I learned satan heals, too. For believers, it’s vital to discern the difference between the two kingdoms, and that gift is given by God the Holy Spirit. What’s sad is that God placed yours truly across her path just at the time of satan’s onslaught in her life. She now feels powerful and really thinks she has found the truth. Another lie. Another counterfeit. Only Jesus is the way, the truth and the life. If she is hungry for the truth the Lord will continue leading her to it. It could be she is the middle of the Lord’s plan. Keep believing and praying for her. It is the same with the term “God the Son.” They never used that term either. Neither “God the Son” nor “God the Holy Spirit” are Biblical terms. Often, the above titles referring to the Spirit of God were used interchangeably, but the main distinction between the general term for God as Spirit (“One Spirit,” “Same Spirit” (1Corinthians 12:9, 11, 13), “One Spirit” (Ephesians 2:18), “There is one Spirit” (Ephesians 4:4), is that the Holy Spirit was not given for the actual infilling of the believer until the Day of Pentecost fifty days after the Lord’s resurrection. If you have wondered why Pastor G and I use the term God the Holy Spirit, it’s because many God has placed across our path speak of Him not as a Person but as the power of God. That’s why we have been led to make this very important distinction and will continue to do so unless God leads us otherwise. Just wanted to clarify that for you and all who read these comments. I understand. It remains yet another misunderstanding regarding the perceptions of some to think of the Holy Spirit as a non-personal force or power. The early believers never thought this, of course. Not only that, there are several references in the New Covenant writings in which the Holy Spirit is referred to as the Spirit of Jesus. We must be clear in noting that the teachings of the early community of the Lord did not reference two Spirits or three Spirits, or that the one Spirit of God was somehow divided up. See Acts 16:7, Romans 8:11 with reference to John 2:19, and Philippians 1:19 as examples. You are right. We must see God as a living and loving Person who has manifested Himself in three primary ways in order to reach us with salvation and fellowship in Him. RJ: Thanks for your enlightenment. Interesting scriptural insight into the evolution of whom or what changes hearts…the cause and effect of encounters with uninformed or misinformed, “well meaning” or “purposely directed deceivers. Whether motivated by selfish ambition, pride, quirks of position and power or just out of complacency; most are directed under the guise of appearing to be what they in Truth are not. Deception and pride are Satan’s top tools. The simple Truth is revealed to those who believe. The Gospel is what it is. Those who search, teach and preach the Word deliver a message of both sacrifice and salvation. It is a message given by God, through the Holy Spirit. As His chosen vessels we must rely on God’s strength and power, not our own, in proclaiming the Gospel to others.